"Untitled (QueerArch)" is an exhibition of newly commissioned art works by LGBTQ identified artists based in South Korea, which will be completed after their months-long research at QueearArch, also known as Korea Queer Archive. Established in 2002, QueerArch started as a personal archive of Chae-yoon Hahn, a prominent activist who was the editor-in-chief of BUDDY (1998-2003), the first queer themed magazine in South Korea. It expanded its collection to film and moving images upon receiving donations of over 700 films from Seoul Queer Film Festival in 2006. It is the only public queer archive in the region and is currently located at the office of Seoul Pride March in Mangwon area, Seoul. The exhibition will take place at a storefront with works by a group of intergenerational artists. 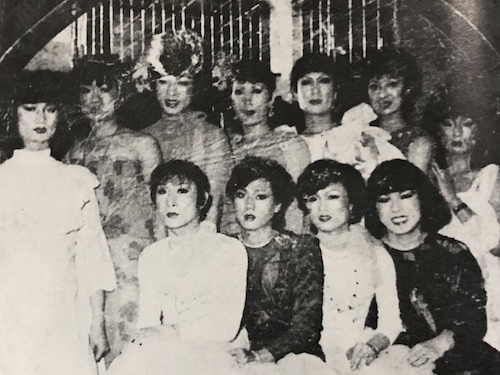 The artists have been actively participating in the making of the project as they research, excavate and appropriate images and texts from the collection and explore the rich history of queer publications, artifacts, music and films that were made and collected since the late 1970s in South Korea. We believe the project will create a pivotal platform that will challenge the narrow perspective of the biased Korean (art) history and the educational institutions' discursive and academic violence in a history of erasure of those who are often labeled minorities. Haneyl Choi will make a sculptural installation with components that will also function as bookcases and storage units for the archive after the exhibition. Nawhan Jeon and Grim Park have been working on paintings that depict their frequent trips to the archive and research process. Inspired by the collection of music and films, Dew Kim and Yuhur's new video works and a mix tape will be released at the opening. In conjunction with the group exhibition, QueerArch will move part of their collection to an adjunct storefront and operate their archive in the temporary space, which will give them great visibility as well as exposure to broader audience. "Untitled (QueerArch)" will be documented as a catalog with essays by Chungwoo Lee, Woong Nam and Jinshil Lee. Chungwoo Lee will focus on the group of artists and writers who died during the AIDS crisis in South Korea while Woong Nam will bring attention to biographies of many overlooked transgender and women activists in the 1980s and early 1990s who took important roles in LGBTQ organizations. Jinshil Lee's new essay will take a look into a younger generation of artists whose works have been influenced by post-queer theories. Through re-emphasization and re-imagination of the archive, this project will make an important step in acknowledging the unique lineage of queer history outside of the Western context and engage collective voices gathered together pointing out marginalized individual experiences, absences in the history of art and in the discourse that informs future thinkers and artists. Kang Seung Lee is a multidisciplinary artist born in South Korea and now lives and works in Los Angeles. Lee is the recipient of the CCF Fellowship for Visual Artists (2019), the Rema Hort Mann Foundation grant (2018), and Artpace San Antonio International Artist-in-Residence program (2017). He received an MFA from the California Institute of the Arts. Jin Kwon studied in London and started a contemporary art practice in Seoul by expanding her interest to forms of exhibition and writing. Kwon's interest has always been in addressing art and cultural practices relating to the history of modern and contemporary art in non-western regions, and their morphology as a way of access into the public. Kwon is currently a curator at Seoul Museum of Art, a public art institution supported by City Government of Seoul.